The ATF’s ability to curb gun violence is severely hampered by legislative restrictions and loopholes in federal gun laws, the New York Times reports, citing law enforcement officials. Making matters worse, the agency has been without a permanent director for six years. To start, current law bars ATF from creating a federal registry of gun purchases. That often makes it difficult for officials to track down records to match the serial number of a gun to an owner, the New York Times reported. The Times wrote that about a third of the cases involve shuffling through cardboard boxes for records because Congress has rejected the establishment of a central database of gun transactions. 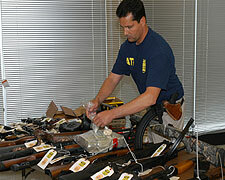 While the ATF is equipped to reduce gun crime, it is bogged down by politically motivated laws. Posted: 12/26/12 at 8:58 AM under News Story.